GD has had an earache all week, it has been coming and going until last night GD was in tears as the last round of paracetamol began to wear off. Whenever anyone has an earache I always recommend the following tried and tested natural remedy. Our whole family were on holiday last week so GD was just popping simple pain killers to keep on top of it, but when I saw how much the earache was still holding on last night after having returned home, I made my trusty remedy. 1.Pop a nice fat onion in the oven on a baking tray for about 20 minutes in a moderately hot oven (around 180 degrees Celsius). 2.Let it cool enough to handle, then peel it, cut it in half and give it a press. 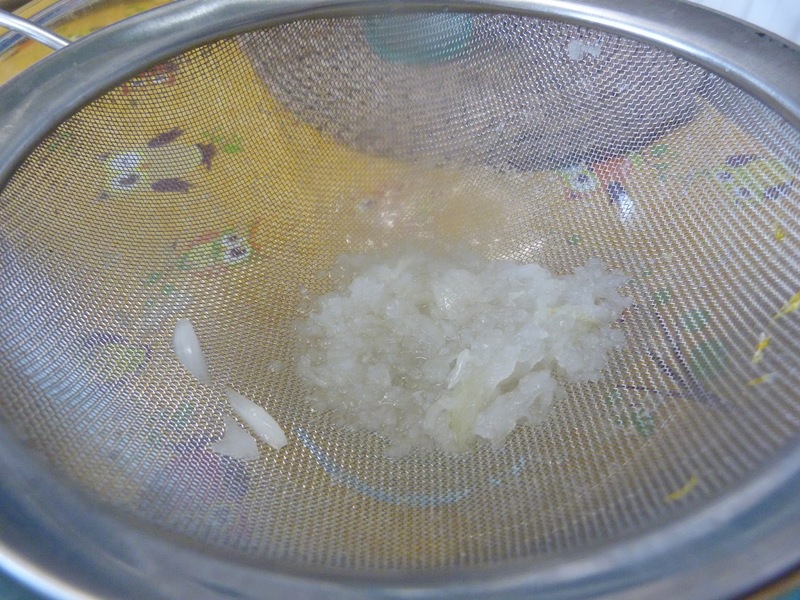 This time I experimented using my garlic press, letting the clear juice run through and collect in a bowl, it was more fiddly this way but it gave a good result. 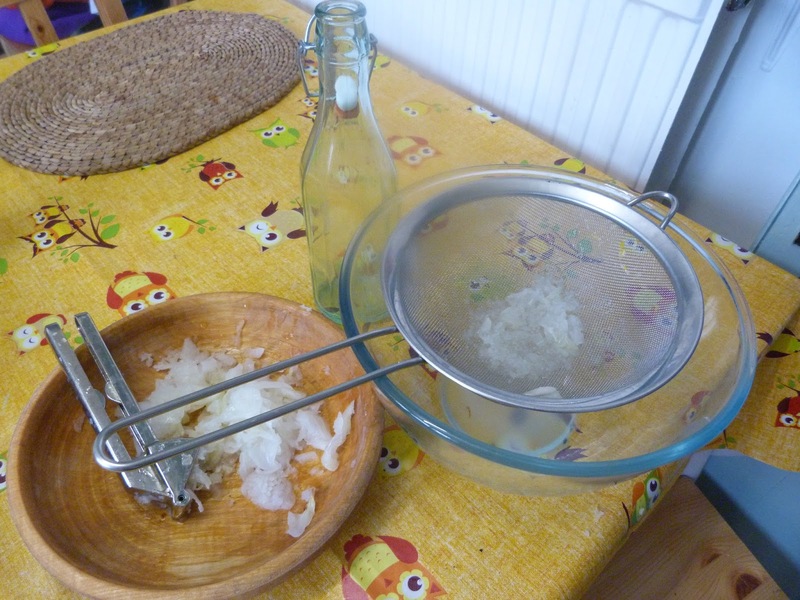 Another way is to put the cooled onion in a muslin bag or jelly bag I think they are referred to in the states and squeeze the juice through. But you can simply cut the onion in half and squeeze it, you only need a few drops anyway.The idea is to keep the juice nice and clear and the pulpy bits out as far as possible. 3. I like to give a final strain through a sieve, I have heard people strain through kitchen towel but I haven’t tried that my self. 4.Funnel your juice into a clean bottle or container and label up. Keep in case follow up dose needed. Discard unused juice when finished. 5.Use a pipette or just pour some oil onto a teaspoon and drop a few drops into affected ear, leave head tilted and plug with cotton wool. Leave juice to do its work. I have found usually works within half an hour. I like to give a second dose within the next twelve hours just to be sure, even if the recipient is feeling better. 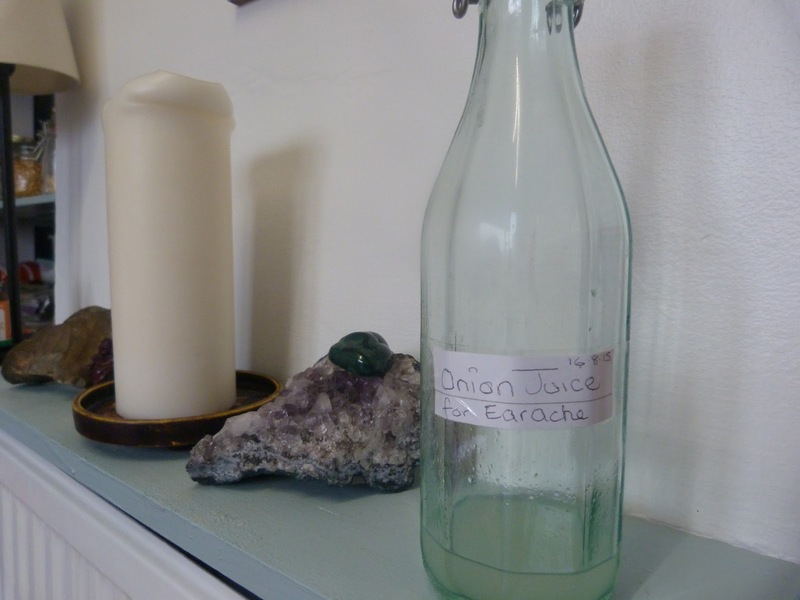 Onion juice has anti bacterial and anti inflammatory properties. I have used this remedy for the past decade and it has worked for our family on countless occasions for the adults and the children, it is one remedy the whole family uses. Earache pain generally is caused by inflammation and can be treated effectively with onion juice, however it is not meant to be an alternative to seeking a qualified doctors advice, earache can have other causes which may be more serious.